One of the most difficult things to deal with in life is the death of a loved one. Even for the Christian, death is a part of life. Unlike they that do not believe, the Christian has a blessed hope – that is the return of the Savior Jesus to catch up His Church and bring them to eternal life with Him and God the Father in Heaven. Here are some scripture quotes about death that I hope will comfort you . 1 Thessalonians 4:16-18 For the Lord himself will descend from heaven with a cry of command, with the voice of an archangel, and with the sound of the trumpet of God. And the dead in Christ will rise first. Then we who are alive, who are left, will be caught up together with them in the clouds to meet the Lord in the air, and so we will always be with the Lord. Therefore encourage one another with these words. 1 Thessalonians 5:9-11 For God has not destined us for wrath, but to obtain salvation through our Lord Jesus Christ, who died for us so that whether we are awake or asleep we might live with him. Therefore encourage one another and build one another up, just as you are doing. 1 Corinthians 15:54-57 When the perishable puts on the imperishable, and the mortal puts on immortality, then shall come to pass the saying that is written: “Death is swallowed up in victory.” “O death, where is your victory? O death, where is your sting?” The sting of death is sin, and the power of sin is the law. But thanks be to God, who gives us the victory through our Lord Jesus Christ. 1 Corinthians 15:20-23 But in fact Christ has been raised from the dead, the firstfruits of those who have fallen asleep. For as by a man came death, by a man has come also the resurrection of the dead. For as in Adam all die, so also in Christ shall all be made alive. But each in his own order: Christ the firstfruits, then at his coming those who belong to Christ. Philippians 1:23-24 I am hard pressed between the two. My desire is to depart and be with Christ, for that is far better. But to remain in the flesh is more necessary on your account. 1 John 3:1-2 See what kind of love the Father has given to us, that we should be called children of God; and so we are. The reason why the world does not know us is that it did not know him. Beloved, we are God’s children now, and what we will be has not yet appeared; but we know that when he appears we shall be like him, because we shall see him as he is. i am finding all the information something I want to learn more about. Absolutely everything I saw I want to read. I am going to try and get a lot of it printed out… My husband is stage 4 cancer and we have so much going on in our lives at this point. We pray that we aren’t going to need a lot of the things that you talk about in this but I am wanting to learn it all. Carolyn, you are loved, and we are praying for you, that God’s will be done in your life. Run to Him. He will not disappoint. My dad has cancer. I have watched it break his body, but never his spirit. Christ is ours, and we are His. Let us look to Him. My 24 year old passed away in a tragic motorcycle accident in August 2015. My mother passed away in January 2014. I never experienced such hurt and pain. The lost of a child however, can only be explained by those who’ve gone through such. I’m reading God’s word, praying and seeking Him like never before. I’ve always believed in God, His word and what shall come. What I’ve read from these articles have really blessed me. I enjoyed reading the verses . They were comforting. I lost my husband in a motorcycle accident in 1991. I turned to God for quite awhile learning to be closer to him and to hear that small voice in my heart I prayed eventually for a good husband and it took a little while but God helped me find the right man. My twin sister is in stage 4 colon cancer and I have PulmonaryFibrosis.We’re 67 right now.We both are saved and love the Lord. I’ve read these scriptures before,but when they become something you’re looking at they take on a whole new meaning. It’s comforting to know God’s Promises and His Word.And to know He’s Faithful. So however He works it out with us, I believe we are both going to see each other again. That’s the conciliation through the pain and hurt of the possible loss. Of course you think about your children, Grandchildren, siblings and other family. Our prayer is that the unsaved ones will get saved, study the word and be obedient to Jesus’s commands. We would appreciate your prayers. Be blessed in Jesus name! 1 Thessalonians 4:16-18 says that the “dead in Christ will rise first”. But, you say that the moment we die, we go to be with the God. I’m not sure I understand. Can you clarify? Thank you Charlie. 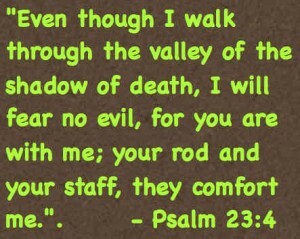 That verse corresponds to Jesus return but if you die before that happens, you are with the Lord. Make sense? my brother passed into glory and my family believe that he has visited them during their worst periods of grieving and continues to visit and it has now been 8 months. I do not believe this, I think perhaps angels have visited? What scripture can I read about this subject? Thank you Sharon. There is no absolutely no biblical evidence that a person can come back from being with the Lord to visit family. Angels do not do such things, even once, in the Bible. Thank you for the bible verses, I needed this right now. Praise Jesus the son of God almighty! I have a dear elderly friend who is dying with terminal cancer. I need some encouraging words of scripture to give to him, but don’t know what is appropriate to give. He is a believer in Jesus Christ. I am sorry this heartache my friend. Why not use these in the article David? There are 20 Scriptures that are just for this occasion sir. I hope they help. This is really comforting to know. I am looking for ways to resassure, comfort and support my mother whose mother (my grand mother) who’s not really on her death bed so to speak, but has been sick off and on since 2009. She is now in a nursing home and she has suffered another stroke. My mom whom I consider to be a woman of faith at times let’s it waiver and her flesh gets the best of her. I’m trying to get her to a place of understanding that it’s ok to be at peace with this and the only reason I feel that she is still hanging on is because she (my grandmother) is waiting for her 7 children to be at peace with her going home to be with the Lord. In the weeks since this comment she has stopped eating. She signed a form stating that she did not want to be on a feeding tube and she also has a DNR. She is/has been really suffering for the last 8 years, and it’s not getting any better, and my mom and her siblings just can’t see it. Some of them even go so far as to say it’s all in her head and she’s FAKING! Now, bear in mind my grandmother is only 74 years old, and this is no accident her ending up in this position. It’s years of misinformation, stubbornness, blatant ignorance of her generation, and just absolute down right refusal to to right and take care of herself. I’m really in prayer for my mom and her siblings that they can come to terms with her condition and allow her to go peacefully when she’s ready. The Lord told my grandmother that she will be cured from her cancer that she has had for eight years, from this day. All of my family believe it is time for her to go but if God told her she will be cured, I have to believe her right? Do you have any advice for me? Should I believe my family. My wife was taken to be with the Lord on January 3, 2017, after battling cancer for over three years. We were married for almost 39 years and losing her was, and is, the most painful event that has ever happened in my life. My mother, who was living with us, had died in February of 2014, the same month that we found out my wife’s cancer, after surgery, had spread. There is no comfort in this world that has alleviated my pain, except the comfort of God’s Word. Thank you for spreading the Word that will comfort others, if they only accept Christ. Praise God for His Son Jesus Christ, who is “the Way, the Truth, and the Life”. I am so sorry for your loss. I would say that it is not goodbye for those who trusted in Christ because they will see him again, but for those who have not yet repented and believed, it is goodbye. You can comfort the Christians among you with this verse: “But we do not want you to be uninformed, brothers, about those who are asleep, that you may not grieve as others do who have no hope” (1 Thess 4:13) but cannot comfort those who don’t know Christ. Just tell them that he’s not dead but with the Lord and leave it at that. It is hard to comfort those not serving the Lord. I still dont see when we die now where we go though? A friend of mine just found out that her 8 month old daughter (in foster care temporarily) was mauled and killed by a dog hours after a scheduled visit. She is in treatment to get her daughter back but now will never see her again in this life. Please help me with some good news to give her that she can understand in good from the bad. Or words of comfort. This just happened a few hours ago. Pls i want to know if @ the end of days that is @ the end of this world the righteous ones are to live on a new paradise on earth forever or in heaven with christ becos people do say we will reign with christ in heaven.